Mommas & Mimosas: Night Owl to Morning Lark Success. The One Thing That Finally Worked! 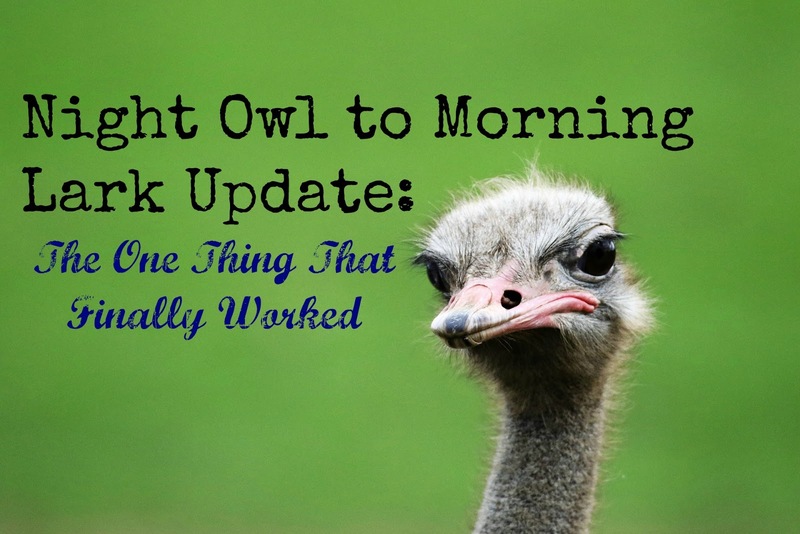 Night Owl to Morning Lark Success. The One Thing That Finally Worked! Well, I finally did it. I have been getting up at 6:15 pretty consistently, and I didn't even realize it. Since I survived Thanksgiving break and kept my routine, I'm calling it a success. There were a few gradual changes that I made based on what I learned from previous attempts (or fails: see Project Night Owl to Morning Lark What worked and What Didn't), but what worked the most for me was having something that I wanted to do more than sleep...journal. I started each morning by stumbling to the kitchen, making my latte then heading to my office to write. Some days I stare at the paper wondering if I have anything to say. Sometimes I even start that way, "I'm not sure if I have anything to say today" Inevitably stuff comes out though. Admittedly, sometimes it is stuff that pops into my head and I think, "Oh, I can't write that. That's not nice. I shouldn't think that, let alone say or write it," but that is exactly what I do write, and should write because it's in there and needs to come out in a safe place that no one sees (or hears). Sometimes it's mundane stuff like what should I get so and so for their birthday or Christmas. Sometimes it is a list of stuff that I need to do, want to do today or someday. Sometimes I practice a conversation I need or want to have with someone. The point is that it is unedited, no grammar police allowed, and some days the handwriting is so bad no one could read it if they tried, and it doesn't go into a pretty journal I don't want to mess up. It goes in a regular old spiral notebook that I pickup from Target during school supply shopping. One that I can scribble in, doodle in, draw stick figures then savagely scratch them out in. It's a no judgment zone, and it's all the stuff that you keep in your head that you keep moving around and pushing to the side so you can get through your regular day. That stuff doesn't go away though, and it tends to surface at night while you are trying to sleep or at 3 AM when you are trying to stay asleep (Read this to see how important uninterrupted sleep really is for your health: This One Thing Can Cause Sadness, Forgetfulness, Depression, and other Woes). Getting it out is like losing weight you didn't realize you were carrying, and you didn't even have to exercise! Now, I have to have the coffee. I light a candle and put on my favorite polar fleece jacket or wrap up in a quilt to get started. I had to make it a little enticing in the beginning, but I wouldn't trade that time for more sleep now. I usually take the weekends off, and I have been contemplating learning to doodle, reading or listening to something inspiring that I don't typically make time for during the day on some of my mornings. Here is the best part, if I fall off the wagon for a day or two or even a month or a year, I know what I need to do for me to get back on track, so no matter what happens in the future, it's a win. I have tools forever now, so there is no failure, only learning. So my number one advice for turning yourself into a morning lark is find something that makes getting out of bed worth it and stick to it for a while. What I found is that I don't stay up as late now because I know it will make getting up harder, and I am also more apt to put my phone away earlier for this same reason. Those things alone didn't do it, but rather were the tools to make doing what I wanted to do easier. As an added bonus of journaling...I sleep better and I worry less. Or at least my worry is from 6:15 to 7:00 AM then I can put it away for the day and come back to it the next morning if I choose. I would still like to get up earlier still, but baby steps, baby steps. So try it this week. Create a little cozy space in the morning this week and write away while it is still peaceful in the house, then burn it, tear it up, keep it to look at later, whatever makes you comfortable, but get that sh*t out. I promise you, you will sleep better.